We’ve been trying to take advantage of the last of the warm, sunny weather before it’s gone, but I promise we’ve still been eating well! Jeremy got a big package of boneless pork ribs and my only plan for it was to make posole, which has been on my list since Alton Brown said it was possibly his favorite dish of all time. I even bought dried hominy from Rancho Gordo specifically to that end. But dried hominy requires soaking and cooking like beans, which requires advance preparation, so I used up part of the pork in the meantime with some improvised autumn flavors: a braise of apple cider, molasses, mustard, ginger and coriander. 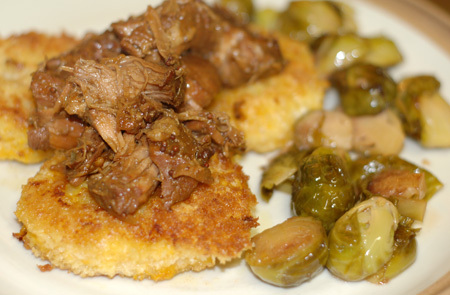 I served the chunks of pork over some crisp little risotto cakes, made up from that leftover red kuri risotto, and some cider-glazed Brussels sprouts that turned out very well. 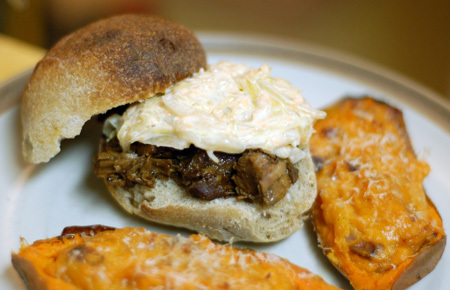 The flavors of the pork reminded me of nothing so much as barbecue, despite the lack of heat, so on a whim, I shaped some of my sourdough into rolls rather than loaves, and we had pulled pork sandwiches for dinner the next night. I am a big fan of coleslaw with my barbecue-type food, but the only cabbage I had on hand was fermented. Have you made sauerkraut coleslaw before? I based it on my new favorite coleslaw recipe, using less vinegar thanks to the natural tartness of the kraut, and I thought it was delicious, and very like the sort made with fresh cabbage. It was fortunate that I only made a small amount, though, because Jeremy isn’t as enthusiastic about coleslaw as I am and took a pass. He did, however, like the twice-baked sweet potatoes, which I loaded up—a little too much, admittedly—with Grana Padano and brown sugar-glazed bacon and onions. Heat the butter and oil over medium heat in a large saute pan and add the Brussels sprouts, garlic, red pepper flakes and a good pinch of kosher salt. Cook, stirring occasionally, until the sprouts are browned in spots. Pour in the cider (you want enough to cover the bottom of your pan by about 1/4″), reduce to a simmer, cover and cook until sprouts are tender, 10 minutes or so depending on their size. Remove the lid, add the sugar and vinegar, and allow any remaining liquid to reduce to a glaze. Taste and adjust seasonings if necessary. Source: Freely adapted from Vcstar.com. Preheat oven to 400F. Place the sweet potatoes on a parchment-lined baking sheet; bake until tender when pierced with a paring knife, about 45 minutes. Remove from oven; let cool slightly. Heat a skillet over medium high heat and add the bacon; when most of the fat has rendered out, pour some of it off, leaving the bacon pieces in and add the onions. When the onions are translucent, add the brown sugar and stir until dissolved and just bubbly. Remove from the heat. Melt 1 tablespoon butter in a small skillet over medium heat. Add shallots; saute until soft and fragrant, about 2 minutes. Add rosemary, and cook 1 minute more. Remove from heat, and set aside. Slice each potato in half lengthwise. Carefully scoop out flesh, leaving about a ¼ -inch border all around potato halves; place halves on a baking sheet, and set aside. Place potato flesh in a bowl, and add the butter, bacon mixture, rosemary, egg yolk, and cheese. Mix well until smooth and combined. Season with salt and pepper to taste, then spoon the filling into the shells, topping with an extra sprinkle of cheese. Bake until golden, about 20 minutes; if the cheese on top hasn’t browned up, you can run the broiler for a few minutes to get better color. Serves 2-4. Source: Adapted from Frugal Village Forums. I love posole too, it’s such a comforting dish. But the way you ended up using the pork looks fanastic too. The posole recipe is coming today!